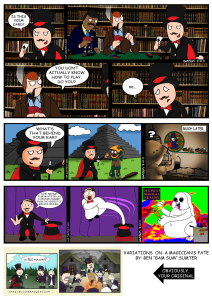 AmazingSuperPowers: Webcomic at the Speed of Light - ASP Anniversary Contest Winners! Presenting the winners of the ASP Anniversary Contest! 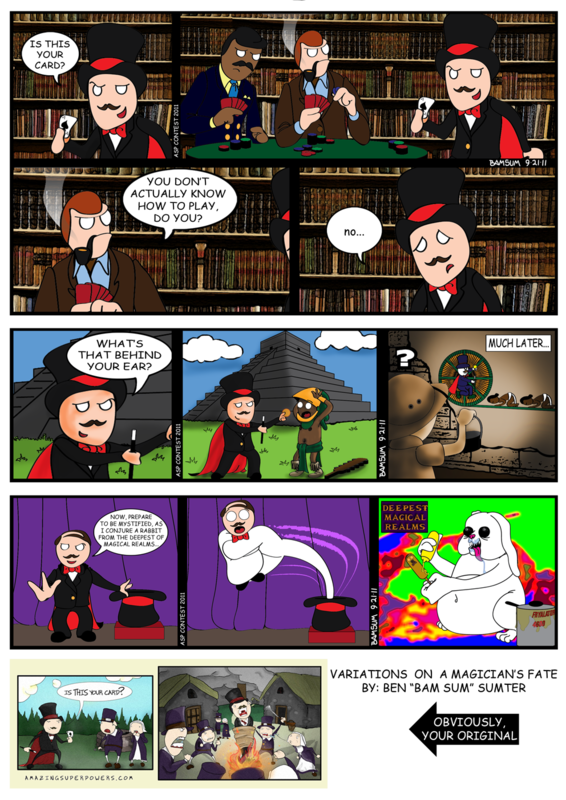 “Variations on a Magician’s Fate” by Ben S.
He drew some extensions of the “Magician” comic that turned out pretty great, especially the Mayan getting his mind blown and the terror nightmare rabbit. “Broken Arm” by Jenny S.
Video based on this comic. She and her friends made a shot-for-shot remake of “Broken Arm,” and considering the degree of faithfulness we’re going assume that the lead actor actually broke his arm for the part. “Skip’s Tribulation” by Chad J. Short story based on the “The Movies” series. A short story inspired by the “Movies” set of comics, and it was such a morbid interpretation of Skip’s psyche that we thought we should at least try to cheer Chad up by giving him a book. Click here to read the story! (PDF). “Conscience” by Jörg P. and Fabian S.
Song Inspired by this comic. They wrote and composed a song inspired by the comic “conscience.” It’s one of the first times ASP has been translated to music, and it came out pretty dark and occasionally off-key. Perfect! Great work, everyone, we really appreciate the time everyone took in entering! You are all the coolest. I don’t think it’s a good idea to have both the ASP contest and Nobel Prizes around the same time. Obviously you can’t change yours because it’s an anniversary so they should probably move theirs to a less conflicting date. Bah, I was so hopeful to win this one… but it’s…. o-kay… I guess. Anyway, when are you guys going to make a new wallpaper? something with all ASP cast together or something. I’d really appreciate that! Specially if it’s in 1600×900.